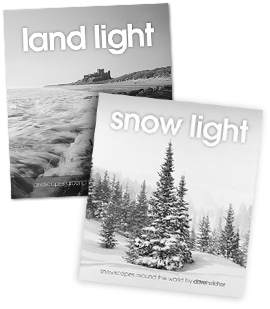 New Books Out Now – Snow Light and Land Light! I’m now the author of 6 books, not counting my PhD thesis and Degree dissertation (very limited print runs for those)! My 2 newest books were delivered from Loop Printers in Sheffield on Tuesday, well half of them. Their van is too small to fit all 3000 copies on it. This is the culmination of a project lasting over 10 months. I estimated that it would take 9 months, so it slipped by just one month. It had to fit in around shows, courses and making prints to fill orders, as well as making videos and writing articles for darkroomdave.com, etc. It needed lots of time scanning negatives, more than I expected as the images on my website up to October 2008 were scans from prints. These aren’t good enough quality for my books and led to me re-scanning dozens of negatives. In fact I scanned getting on for 400 negatives to select the ones that we used. I can only scan negatives singly and edit one at a time so it was a huge amount of work. My bad back will take a while longer to recover from all those long hours in front of the computer! Andy, of 10th Planet, has added them to my website Books page so that you can now buy them! We are selling them at £12 each, including UK shipping, instead of the £15 cover price. There is also an introductory bundle special offer of £20 for the 2 books together, again including UK shipping. Outside the UK we have to charge extra for the shipping. I will be adding them to my marketplace shop on Amazon UK over the next few days but they will be full price as Amazon take a hefty commission on every sale. You can also order through booksellers but these will be at full price as well as I don’t use distributors, booksellers buy from us direct. Both are the same dimensions as my previous 4 books, 24.5 x 27cm with 80 pages. Of course all images are in glorious black and white! There is the usual technical data on every image at the back of both books for those interested in the nuts of bolts of my photography. Both books include images taken in the UK, Europe, USA and New Zealand.